I love books and as I live in a shared house my room is full of books. There are books on bookcases, in cupboards, under the bed, along the wall, in a pile by the bed, on my bedside table, under my chair, in my knitting box….. everywhere and it’s only one room. Moomin books by Tove Jansson – I love these, I have done for years. Especially if I’m feeling down. I love that all the characters have such different temperaments. Little My is my favourite character as she’s tiny and grumpy but extremely brave. I admire Snufkin’s wonderlust and ability to explore every winter. And I love the Hemulen in his dress! 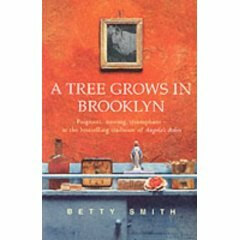 I Capture The Castle by Dodie Smith, Tree Grow In Brooklyn by Betty Smith, Lucia Lucia by Adriana Trigiani – some lovely feel good stories. I’ve read and re-read them loads of times. I love the descriptions of fashion and Manhattan in Lucia Lucia, I love the little things in A Tree Grows and I love that the girls live in a castle in I Capture The Castle. I also love Dodie Smith’s children’s books and Adriana’s other stories. Jane Eyre and Pride & Prejudice – I’m a late starter on these but I love them now. I only read Jane Eyre because I read the Eyre Affair by Jasper Fforde and didn’t know what had been changed about Jane Eyre so afterwards I read it. I like that Jane is feisty and not simpering. I’ve just finished reading P&P and I think Mr and Mrs Bennett are really funny, I didn’t get that until now. I’m going to read all Miss Austen’s other works now. Before it starts to sound like I just like girly books, I also really enjoy science fiction and fantasy. I like Terry Pratchett, Asimov, David Eddings, Stephen Donaldson, Robin Hobb, Iain M Banks, Mike Carey and love Michael Marshall Smith’s science fiction stories. I’ve read Only Forward so many times I can’t remember how many. I wish he’d not gone mainstream! And I love everything by Neil Gaiman especially if Dave McKean illustrated it. I also like books about World War II especially The Great Escape by Paul Brickhill, The Dambusters by John Sweetman and Tuesday’s War by David Fiddimore. And I love books about life in the circus – Water For Elephants by Sara Gruen and The Circus is Coming by Noel Streatfeild, but they are harder to find. I also like Kelley Armstrong’s supernatural stories, they appeal to the part of me that likes Buffy The Vampire Slayer. Diana Wynne Jones, Philip Reeve, Philip Pullman, Marcus Sedgwick, Garth Nix, Elizabeth Kay, Charlie Higson, Hugh Lofting, Lucy M Boston, Cornelia Funke, Oliver Jeffers, Holly Black, Paul Stewart, Chris Riddell, Rick Riordan, Michelle Paver and many many more. Thank you for reminding me about the Moomins – I think my little neice is getting to the age to appreciate them – great opportunity to revisit! Oh you should definitely read them to her. I know some people just remember the tv series from their childhood and were freaked out by it (strange people) but because I read them before I saw them I was never scared. I love your sock knitting, it’s very inspiring.